The special edition draws from Mopar's extensive accessories catalog. Jeep brought a whole lot of metal to Geneva this year. Most of it was revealed in the ramp-up to the show, but the off-road vehicle manufacturer kept one under wraps until to doors open at the Palexpo. And here it is. The Jeep Wrangler Rubicon 1941 showcases a broad range of upgrades fitted by Mopar, the Fiat Chrysler group's components division. And if you like what you see, you can buy just about all of them from the Jeep Authentic Accessories and Jeep Performance Parts catalogs to outfit the off-roader of your dreams. So why 1941, you wonder? Well that's the year in which the original Willys Jeep debuted. It was also the year in which the United States entered World War II and started sending the go-anywhere vehicles overseas to mobilize the Allied forces. And though the yellow and black livery speaks more of private adventure than military deployment, Jeep's military roots in liberating Europe is a point you couldn't avoid. At any rate, the two-door Wrangler Rubicon soft-top is fitted with just about everything that Jeep and Mopar could throw at it. And that extends far beyond the fresh coat of Hella Yella paint. The long list of components includes a two-inch lifted suspension, snorkel intake , the rock rails, and trim that's been all blacked out – including the seven-slot grille, door sills, fuel door, mud guards, off-road lights, mirror caps, grab handles, and mesh roof. The interior's been fitted with all-weather floor mats and special steering wheel, gear knob, and tailgate table. Despite all the upgrades, Jeep says it's still 100-percent street legal, and will begin offering this specification this summer, based on either the Sport or Sahara trims. 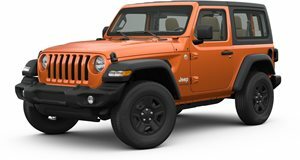 But if you're more a do-it-yourself type, Mopar offers over 200 accessories for the Wrangler to choose from.